According to research firm IDC, the top six Latin American countries leveraging Customer Relationship Management (CRM) business software systems include Brazil, Mexico, Argentina, Chile, Columbia and Venezuela. The single most business factor leading to increased CRM adoption in Latin America is the surge in business process outsourcing. The continued demand by U.S. companies for offshore outsourcing resources is moving near shore and bringing increased Latin CRM software adoption for those organization's looking to earn that business. Near shore outsourcing taps into countries which are culturally and geographically closer to the U.S. and includes destinations such as Canada as well as most central and South American countries. Near shore benefits include common time zones for real time communication, strong english language skills and short proximity for easy visits. Call center operations are expanding at aggressive rates and adopting CRM software applications as the foundation for their businesses. According to analyst firm Datamonitor, Brazil, Argentina and Chile provide the lowest fully-loaded call center agent price within the Americas and are appealing to U.S. companies in part due to their large labor pool, strong multilingual capabilities, proactive marketing to the U.S. market and efficient use of CRM software systems. Mexico, despite being nominally more expensive, is also a cost-effective and growing location. A survey conducted by the Instituto Mexicano de Telemarketing (IMT) forecasts high contact center and CRM software adoption within Mexico. The Mexican call center and IT outsourcing industry employs nearly half a million people, including over 9,000 call centers with over 200,000 agents. Continued growth is predicted at 16 percent. Datamonitor claims that Mexico has emerged as a stable and financially attractive alternative to offshore locations in India and China. Katherine Shariq, analyst for Frost & Sullivan, states another advantage becoming more visible in the current economic climate, "Generally speaking, a sluggish environment causes a lot of companies from industrialized countries to move call center operations and CRM applications to developing countries in order to take advantage of more favorable economic conditions." However, several Latin American countries such as Costa Rica have not kept pace with business growth and U.S. companies in those regions are incurring double digit cost increases year after year. According to Call Center and CRM analyst Peter Ryan of Datamonitor, "Cost management is a huge problem for many offshore contact center investors, and in most cases this is unnecessary. By being able to predict where costs will rise as a percent of total expense based on current trends, prudent financial management and healthy bottom lines should not be difficult outcomes." The Latin American call center and information technology (IT) outsourcing market is predicting shake ups in the very near term. According to Mark Minevich, principal at Going Global Ventures, "Costa Rica will struggle to remain competitive because they'll be unable to maintain the population growth and skilled workforces necessary to remain attractive to source nations ... We fully expect Costa Rica to drop from the top 10 and for Brazil to rise to number four. Brazil has huge potential, due to its large population, the creativity of its engineers and government programs supporting the IT outsourcing industry." 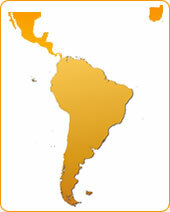 SAP launched in initiative in mid 2008 to become the Latin American CRM software leader. According to SAP Latin America CRM specialist Inés Castro, SAP is targeting Latin American services, manufacturing, telecommunications, financial services, utilities and consumer products industries with its newest CRM software solution, version CRM 2007. According to Castro, these types of Latin American companies are plentiful, and while CRM software solutions are currently not a key factor in their business processes, they are increasingly concerned about increasing sales and offering more value to their customers. Largely due to their market size Brazil and Mexico are predicted to contribute the most CRM 2007 sales in the coming years, however, Castro said SAP's Latin American management team has identified big opportunities in Argentina and the Andean region, particularly Colombia, as companies in these regions are increasingly more oriented to business development and customer satisfaction. SAP cites analyst firm IDC statistics indicating that SAP retains the largest market share position in the Latin American CRM software market. Oracle's Siebel product retains the second largest Latin American CRM market share.